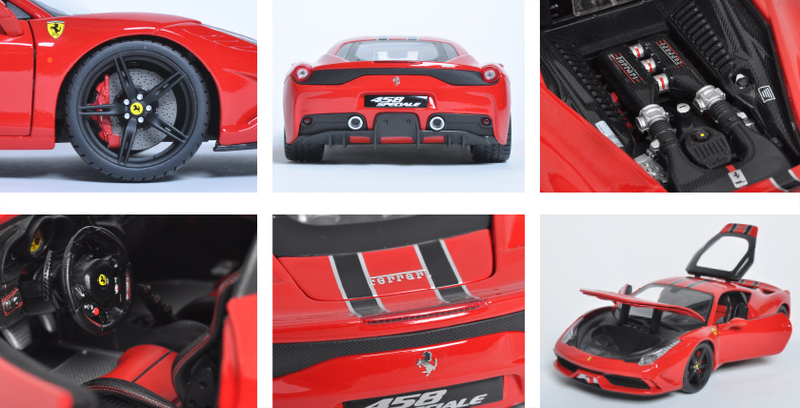 Hong Kong (April 2015)— The May Cheong Group (MCG), manufacturers of the famous die-cast and radio control replica brands Maisto and Bburago, has announced additional details and released photos of the company’s 4th title in their first release of the hobby‐grade replica Ferrari Signature Series line. The latest title is the 458 Speciale. Bburago announced there would be over 20 different enhancements to the Signature Series 458 Speciale from their already highly-­‐detailed Race & Play line. Some of the variations between the 2 brands are obvious to the eye, such as the Signature Series closed, red outer box with vehicle rendering and foil-stamping branding. On the vehicle itself, the unique Rosso Scuderia with twin black stripes coordinates nicely with its black wheels. Details such as the Ferrari logo over “Brembo ceramic carbon” text on the red brake calipers are harder to see but are well defined. Further details are highlighted in the photos below.